Thymus.---A common plant in kitchen gardens, well known. It is a noble strengthener of the lungs. An infusion of the fresh tops is good in asthmas, and stuffing of the lungs. It is excellent in nervous affections, and a special remedy for hooping cough. It expectorates phlegm, and relieves shortness of breath. It kills worms, and provokes the terms. It is so harmless you need not fear the use of it An ointment made of it removes hot swellings and warts, relieves sciatica, dulness of sight, and pains and hardness of the spleen, it is good against the gout, and swelled testicles, pains in the back and loins. The herb taken any way inwardly, comforts the stomach and expels wind. The Wild Thyme, (See Mother of Thyme) is preferable. For obstructed menstruation, a bath for the feet and legs in a strong infusion, or decoction, gives relief after the failure of all other remedies. 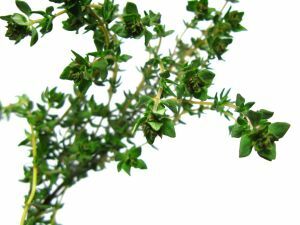 An oil is made from the Wild Thyme, a drop or two of which cures the tooth-ache; apply with a little lint.A writer in the " Lancet" says, " An infusion of Wild Thyme will, in many cases of Hooping Cough, and affections of the air passages, remove the complaint, when all other remedies fail."